Have you ever felt like you’ve hit rock bottom and there’s no way back? Stuck in a rut with no idea how to break free of the muddy mundanity of life? Experienced the most horrific embarrassing moment and feel like the only option is stay under your duvet forever? Or perhaps you’re overwhelmed by mounting debt, which on your salary seems impossible to ever break free of. Or worse… maybe you’re about to hit a milestone birthday and feel like you’ve wasted a huge chunk of your life. Time is so precious. Wasting it is a crime we don’t pay for until we get much older. 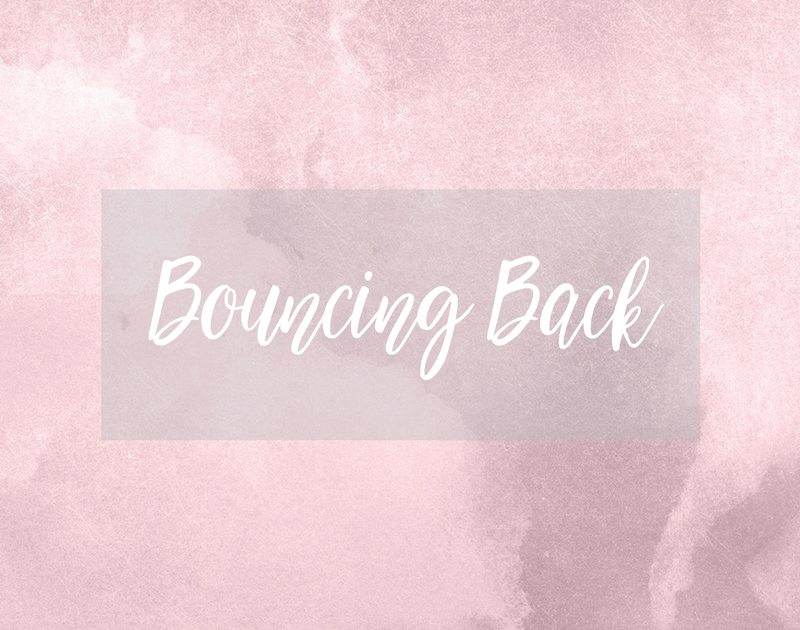 When you feel like there’s no light at the end of the tunnel and that your world is crashing around you, you have to bounce back. But how?! When the odds are stacked against us, most of us have a tendency to give up. Or at least that’s what it feels like. Like we’ve given up. But truth be told, as long as you’re still breathing you haven’t given up. In your deepest darkest moments, you have two options. Close your eyes forever, or listen to your heart beat. When you listen to your heart beat what you hear is your life purpose, the pulse that brings your essence into our time space reality, the magic of universal creation, and one absolutely essential energy receptor in the cosmic web. I say receptor, because when you’ve nothing left to give, it’s time to receive. This is your birth right. You are entitled to joy, happiness and abundance, so take it, and use it to bounce back. Listen to your heart beat and be comforted by its regularity, be awed by the magic, and be grateful to yourself for starting the process. Focus on your breathing, big deep breaths, enjoy the sense of self and love you give yourself as the waves of relaxation begin to wash over you. If you’re a regular meditator you’ll know where I’m going with this but even if you’ve never meditated a day in your life, it doesn’t matter, big deep breaths and counting to ten is a beautiful way to calm your spirit. Now the next few steps you’re going to take are all about you. Forget whatever brought you to rock bottom and instead think about what’s keeping you afloat. What can you be grateful for? You’re breathing right? Are you healthy? Do you have friends or family? A roof over your head? Food on the table (even if it’s just beans on toast) ? A job (even if it’s not your dream job) ? Are you loved? Do you have a pet who keeps your spirits high? A partner, who might not totally get what you’re going through right now, but they’re still sticking around for the long hault? Do you have access to a phone? The internet? A bank account (even if it’s empty) ? People you can talk to? Do you have a hobby? Something you can express or release yourself through? Can you go outside for a run? Do you live in a country which allows you freedom? Can you read and write? Can you drive a car? Do you have control over your own life? Even if you answered no to all those questions, I guarantee you said yes to the last one. If you didn’t, ask again, and be honest with yourself!! If you answered yes to more than just the last one then you’re in a better place than you thought you were. Can you feel the gratitude begin to flow through you? This is finding your silver lining. Now think about the problem, the reason you’re on the floor, and wallowing in self pity, anxiety and dread. Is it possible this happened for a reason? If you’re going through heart break, is is possible he/she wasn’t the one for you? If you’ve lost your job is it possible there’s a better one around the corner? If you’ve lost your home, is it because your finances needed a shake up and you need to be more realistic with what you can afford? Perhaps the next house won’t be so stressful? Have you fallen out with a best friend? Is it possible that they were going to cause you some more serious harm and upset so that’s why they’ve been removed from your life? Whatever you’re going through, as awful as it might sound, it’s likely because you need to learn something or experience something in order to grow. There is a divinity in the grand design, and it’s not designed to squash us. The opposite is quite true. We were born to ascend, and the universe seeks to elevate us, no matter how questionable its methods may seem at certain times. If you can change your thoughts, you can change your life. Shift your focus from wallowing to possibility. Accept there’s a greater reason for your experience, far greater than you. Move your emotion into a place of gratitude, even for the tiniest things like your heart beat. Practice this feeling constantly and your life will begin to change before your very eyes. The reason for your experience will reveal itself before too long. When you’re in the gutter, even the murkiest water will reflect the stars above. Look up my darling, because that’s the only possible way you can go now.